Discuss the thought and theology behind one of the most familiar features of the Orthodox Church interior: the iconostasis. The idea seemed to be to honor God by making a worship space for Him special. Once more Christians have seemed to be so focused on honoring God they forget the best way is by obeying Him and living by what He taught. Ironically this mimicked how the Israeli idea of a need of a veil or curtain to separate holiness from God from us forgetting the whole point of Jesus was to smash the wall of sin that separated us from God directly. Even with these good intentions this created a special class of really holy people that were somehow better than the rest of us. Priests and bishops got access to the main gates to heaven to enter the sanctuary while deacons and lesser officers got a side entrance, the rest of the masses could look on from a distance. One thing I do admire of Muslims is how in some aspects they can combine the holy with the secular. Two merchants can haggle in a marketplace, but when the appointed time came they could both stop and unroll their rugs to pray. God is everywhere, all places should be considered holy and equally accessible to all. The Crusades have their roots in tensions and desires previous to 1096 but their impact continues even today and will into the foreseeable future. Personally, it is at this point of reading Church History that I detect-or better confirm- patterns in the Church’s behavior. Two grand insights have become apparent. I summarize both in 2 paradigms – lenses by which to view, define and explain ‘Church’ history. Paradigm 1 is the seeming fascination of the Church and world powers to restore the Roman Empire. This drive will lead to many Church decisions and actions being politically rather than spiritually motivated. In fact, it seems obvious from history that in many instances church action is blatantly manipulated by and/or caused by secular kingdom-building needs and concerns. With respect to the Crusades, what started ostensibly as an endeavor to liberate and reclaim Jerusalem and other lost territories (the ‘Promised Land’) from the Muslims, it soon became equally an attack on other Christians (West vs. East) for supremacy and control. This infighting critically weakened Constantinople and the Eastern Empire to where they were no match for the opportunistic Muslim invaders. But the plots and tactics used by the West (the Pope and secular powers – especially Venice and Genoa) would soon backfire. The Western Latin Church (the Pope) lost any Eastern Church to dominate or reconcile with. The Pope’s aspirations of a Universal Monarchy lay in ruins. The fate of the Venetian and Genoan kingdoms was even graver. They lost their trade routes, territories and ports or all their economic gains which they so voraciously sought. The short term thinking of both Church and State left them with a bigger, uglier foe in the Muslims which now threatened their own existence. The Crusades are a microcosm of the story behind the story. The ultimate goal of the Church is power, wealth and dominance. The facts written in history belie the given reasons of spiritual liberation, spread of the Gospel and restoration of Christianity for the masses. The history of the Crusades makes me sad – and mad! Hermeneutically, can I explain the disastrous outcome for the Church of the Crusades as ‘God’s wrath’? Following Old Testament editors who ‘explained’ ancient Israel’s exile as ‘God’s punishment’ can we ‘see’ the consequences of the Crusades as ‘God’s punishment’ on the Church? Also I cannot help but question if the recent modern dialog of reconciliation between West and East (Pope and Patriarch) is just another ‘chess move’ in the continuing saga of Church’s quest for dominance? Is the ‘Church’ buying time for when it again exerts great political power to continue its task? Has the ‘Church’ (especially the hierarchy’s motives) really changed? MacCulloch writes that the roots of the fall of the Byzantine Empire happened close to 250 years before the eventual fall of Constantinople by the Ottoman Turks in 1453. (loc. 9234) The effects of the Fourth Crusade during the 13th century would leave an indelible mark for years to come that affected the future course of the Byzantine Empire and subsequently the Orthodox Church as well. Attacks on Constantinople in 1203 and 1204 and the quick series of deaths of Byzantine emperors all led to the capitol falling into the hands of the Latins/Catholic Church in 1204. 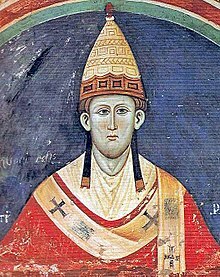 A Latin Westerner, Baldwin, Count of Flanders, was installed as the new Byzantine emperor, large territories of Byzantine lands came under the power of crusader lords, and a Venetian was elected as the Patriarch of Constantinople. As I read this chapter, I could not help but feel an overwhelming sympathy for the Byzantines. I never knew that the Catholic Church had so egregiously betrayed and backstabbed the Byzantine Empire and Orthodox Church in such a way; I had previously thought that it had been all about disagreements in theology. But the schism between the Orthodox and CatholicChurches runs much deeper than issues of theology as we have clearly seen. It’s sad to read about how the Byzantine Empire, presumably the greatest Christian Empire in the world, was so severely weakened and destabilized by this betrayal in 1204 that it had a downhill effect for them afterwards. The Catholics never helped the Byzantines as they were being attacked by the Ottomans, and the Byzantines never asked for help from the Catholic Church again (like they did in 1095 which triggered the First Crusade) during the 15th century, which of course led to the fall of the Byzantine Empire and a severe weakening of the Orthodox Church in that area. I’m sure that this animosity still runs deep today between these two churches from what happened in the past. It is a sad thing when two Christian brothers cannot love one another but be torn apart by greed and betrayal.